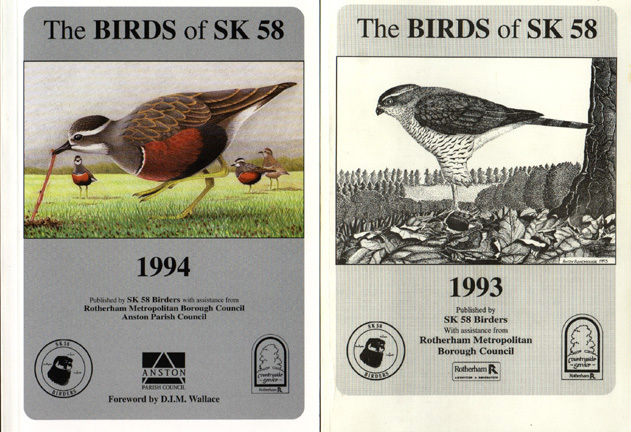 Each year SK58 Birders submit between 8,000-14,000 records, these records are used to monitor the populations and status of birdlife within Grid Square SK58. The records are analysed and the results published in our annual bird report. This is a major undertaking as each species is reviewed, as well as survey results published. The report also includes many line drawings by the areas best bird artists (see a few sample images below), these along with interesting accounts of the group's adventures during the year and accounts of the area's rarities-result in a 150-page review of the birds in the area that year. Our annual report is one of the best reports produced anywhere, by any organisation. Don't take our word for it, check out what British Birds Magazine think of it. Each year the magazine invites local groups and county societies to submit their annual reports. These are judged and awards announced. In 1994 our report won the small group's category by a landslide. We repeated our success in 1995 and won the small group's category again, we also came 5th overall-beaten only by the large county reports. A stunning achievement from a group with limited finances and a membership of only 60. In the awards for 1998 reports, our 1997 report again won the small groups category and came an amazing 7th overall. What is more amazing is that bonus points are awarded for reports published in the following year they relate to. If we had our report out earlier, we would have received an extra six points. This would have put us in joint 2nd place! 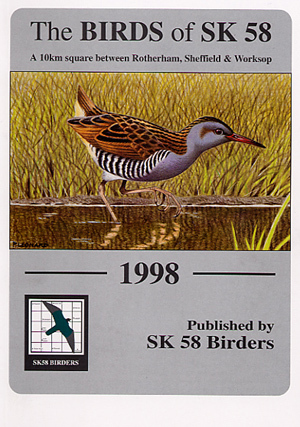 "Birds of SK58 1999" Following the successful style and content of the previous six reports, The Birds of SK58 1999 contains 144 pages of the most authoritative species accounts, survey results, articles and notes of any bird report published in the country. Illustrated by top local artists, and incorporating b+w photo's for the first time. The benchmark by which other bird reports are judged. It's out now and for just £6.95 inc. P+P, is well worth the cover price. (see paragraphs below) Order yours today. Send a cheque/postal order for £6.95 and your name and address to SK58 Birders 5 Ruston Close, Chesterfield, S40 4RY. In the July 2001 issue of 'British Birds' Magazine (British Birds 94:326-328), the annual report awards were finally announced. Yet again SK58 Birders did remarkably well. We just missed out on first place in the small groups category with our 1998 report, by a single point to Manchester with their 1999 report. 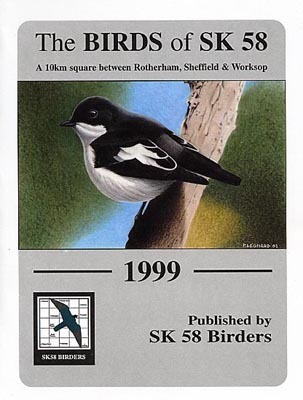 Interestingly; if we had produced our 1999 report within the following 12 month period the report related to, then we would have again been awarded an extra 5 points which would have not only won the small groups award, we would have come 3rd overall-Congratulations to all involved in the production of the bird report. 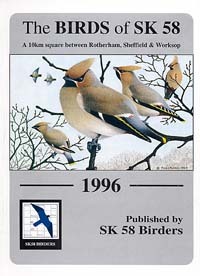 In the March 2000 issue of 'British Birds' magazine (British Birds 93:129-131), the annual bird report of the year awards were announced. Yet again the SK58 Bird Report scooped the award for the best report from a group with less than 200 members (we have 60). Amazingly we came a remarkable 7th overall. Extra points are awarded for producing the report during the next calendar year, if we had met this deadline, we would have come equal 2nd. An amazing result for a small group, with limited resources. 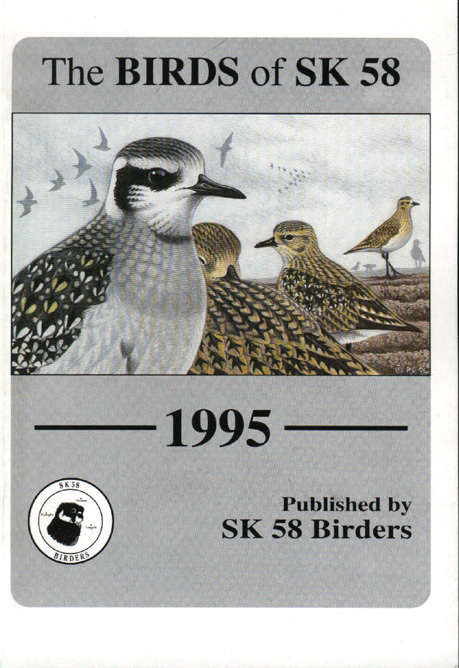 The Birds of SK58 1999 follows our usual format, with summaries of the groups activities during the year, wildfowl and recorders report, survey results and articles. One of the most comprehensive systematic lists anywhere, rarity descriptions, conservation review and much more. Illustrated by top local artists such as Paul Leonard and Yuri Gabrilovich. BUY IT NOW-Don't miss out! !